CoP mission progress beyond 3-5, "Darkness Named"
Pull and clear all three Nightmare Flies. Pull and clear NM Fairy Ring. Yagudo blocking the entrance can be trained away to the northwest, allowing a RNG to Shadowbind Fairy Ring and return to the alliances safely before bind wears off. 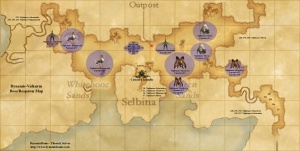 Move east towards Konschtat Highlands zone, avoiding all Nightmare Manticores on the Siren Sands beach area. Pull and clear Adamantking Effigies 286, 290, 294, 298. Pull and clear NM Nant'ina. To save time, it is possible to have a THF pull Nant'ina from its position at the Konschtat Highlands zone in advance, back to waiting alliances at the end of the tunnel. Because it is possible to link additional Nightmare Manticores and Nightmare Sabotenders, it is recommended to have an additional player standing aside to pull Nant'ina from a potential train. 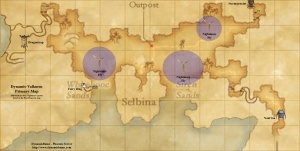 Move west to the gate area north of Selbina. Alliances must position themselves to avoid Nightmare Mantiores and Nightmare Hippogryphs that spawn when Cirrate Christelle is aggro'd. One or two RDM/DRKs using Chainspell Stun consecutively are necessary to limit Cirrate Christelle's special ability use. Cirrate Christelle has shown to use "restricted" abilities even after defeating the corresponding NM. The cause of this has been speculated to either be due to an out-of-range member pulling hate or due to Cirrate Christelle being able to "use" the ability after normal acquisition of 100+ TP. 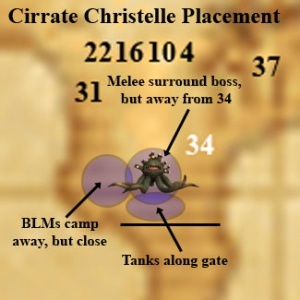 If NM Dragontrap was not defeated, Cirrate Christelle will spawn two Nightmare Morbol pets immediately on aggro. These pets can be slept for a short time using Soul Voice Lullaby, and do not despawn automatically when Cirrate Christelle is defeated. Nightmare Morbols can also be slept with Repose with good accuracy. Cirrate Christelle can use its special ability Extremely Bad Breath multiple times, though usually not more than once during the course of a quick fight. Players in range of this ability are automatically KO'd. Defeat Cirrate Christelle. The key here is to deal as much damage quickly in as short a time as possible (similar to Dynamis Lord strategy). Defeating Cirrate Christelle grants a 60-minute time extension and a small chance to receive 4 random 100-piece currencies. Due to the subjob restriction, players entering Dynamis-Valkurm while the restriction is in effect will automatically lose all buffs applied outside the Heiroglyphics. Due to the size of Dynamis-Valkurm, it is imperative that no players idle when moving between camps. Beastmen in Dynamis-Valkurm have a probability of dropping LV71-specific armor. This page was last edited on 30 August 2017, at 14:18.